It was a beautiful blue sky, puffy cloud day, perfect for the Make Space: installation event at La Reunion TX. I got up there early to do a few finishing bits to my sculpture and clean up around the site. Then I spent the rest of the day talking to people, petting dogs, and enjoying the sun shine. Below are photos of some of the sculptures made by the other artists for this years event. If the names are high lighted they link to the artist's web site. Unfortunately I did not get a photo of Sandra Groomer's installation, but there should be some posted at the La Reunion TX site soon. All the arches are in place, 12 in all, spanning 40 feet. Sadly, the photographs really don't capture it very well at all. I'll be out there early on Saturday, Open House 2-4 to add a few elements around the main arch. These are the flying buttresses that were added for stability. The privet when freshly cut is very bendable. Only a few branches broke during construction. As the wood dries is becomes harder and more apt to brake and split. Over all the structure is very stable. I am expecting the wood to weather very well over it's year long existence. The bailing wire might be an issue with rust, so I'll beef that up on Saturday. Despite the cold and rain, things are progressing. 4 1/2 of the 7 arches are in place. They need to be tweaked and fattened up a bit. I am also adding some side arches at the gate opening for stability. The bundles are tied together with bailing wire, which was donated to the project by Susan Giller, an artist that is known to create strange bunny people with wire. Privet does not have stickers in the normal definition of the word. What it has are numerous pointy bits along the branches that are the stubs of old dead twigs. These twigs can be very sharp. I have been working with the Free Form program for a couple of days now, mostly focusing on making the duck that is part of the tutorial, but I have learned enough to generate this first 3 D model of my sculpture "Chicken Neck Johnson" for the SculptCAD Rapid Artists project. It still needs a lot of work before it is ready to be put through the 3 D printer. At the end of the first day of construction I learned that not all privet can be used the same. If the branch has any elbows it won't bend smoothly. The long shoots that grow straight up in one season are ideal for the ridged bundled arches that the PSP requires. The opening for Make Space: Installation at La Reunion TX is this Saturday, Feb. 27th. With all the rain and snow it has been hard for any of the artists to get out there, but I do have my sculpture sited now, and I have started the framing out of the structure. Above is the concept drawing superimposed at the site. There has been some interesting issues around using privet as a building material, I'll blog about that later. Right now I need to get into my muddy boots and rain coat, pack up the truck and head out to La Reunion TX. 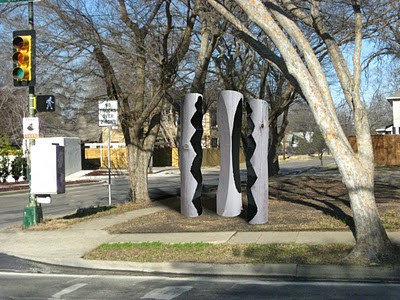 This is one of three Urban Timber Sculptures that Beam Plank And Flitch submitted to the Henderson Art Project. We focused on a minimalist approach that strikes a balance between the natural form and texture of the tree trunks and a graphic subtractive sculpture. Privet growing in the wild sends out branches from a central root ball. It has corresponding small branches that sprout along the main branch. As the main branch grows longer it bends, making an arch. 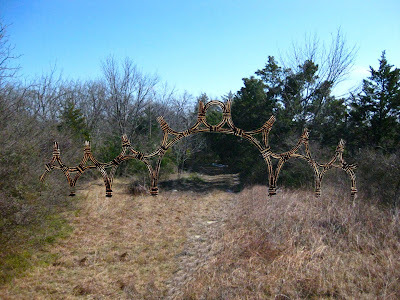 The small branches on the top of the arch grow towards the sun light while the branches on the underside dry up and snap off, leaving rows of small stubs. These stubs are reinforced over the seasons to form a thorn like defense. This pattern of the branch arching, growing and branching out repeats every season resulting in the main branch becoming a series of arches that can extend over 10 feet in length (as observed at La Reunion TX). With each season, new branches sprout from the root ball and grow straight up, using the older branches as support. Once they have cleared the leafy privet canapé, the small side branches begin. The seeds and new leaves will only form on new growth. 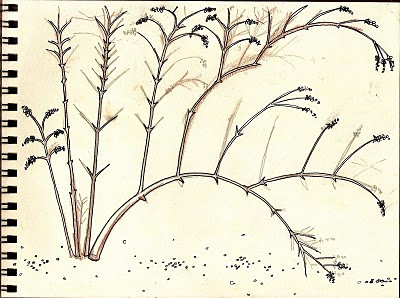 The long clusters of hard round seeds tend to be located on the farthest tips of the branches where they can be seen by animals and whipped about in the wind. Cutting a branch usually results in a growth spurt around the stump and along the branch. Cutting a branch at the base of the plant tends to multiple the amount of new branches sprouting up from the root ball. Cutting all the branches down to the base allows sun light to reach the unsprouted seeds, this combined with a little rain water will activate all the seeds. Frass, Droppings, Spore, Poop... What ever you call it, this is a big stinking pile of privet seeds. One privet bush can produce thousands of seeds every year. These hard round black seeds have a multitude of ways of finding fertile ground. First is the structural nature of the bush itself. It grows in long arching branches that sprout from a central root ball. These branches drop seeds away from the root ball onto new open ground. The branches are also very wiry so in high winds they can act like whips to fling seeds further a field. Due to the small round shape of the seeds, they are easily washed into storm drains and creeks, this being probably the most common form of seeding in urban areas. Birds and some animals can eat the seeds, which are resistant to the acids in the digestive system, so they are excreted later in perfect condition to sprout in new locations. Please note that privet seeds are slightly poisonous to humans, but they will kill a horse if eatten them. With access to the Rapid Cad technology and its incredible array of tools and casting mediums, I instantly had visions of producing my very own version of the “Homer”, a car designed by Homer Simpson that was so outlandishly stuffed with add-ons that it caused the finial collapse of Powell Motors. So, with that in mind, I have tried to focus on learning how the Rapid Cad program works, and how to blind this technology with my own artistic direction, resulting in a sculpture that breaks new ground and makes historical sense. I have of course spent a lot of time just playing; this program seems to encourage that sort of “what if I do this” activity. In the end I have slipped the Rapid Cad into my normal creative process, which begins with lots of drawing on paper, those are then reprocessed and reprocessed to create a composite drawing “Chicken Neck Johnson”. This drawing is scanned onto the Rapid Cad desktop, where it is fleshed out, manipulated, and reprocessed. The resulting 18” X 18” X 6” sculpture is a composite of shapes that I love working with, plus a humorous animal reference, which I credit to the playful, toy making aspects of the Rapid Cad program. The sculpture is made from an almost transparent red plastic. The Rapid Cad program has allowed me to shell the sculpture so that it is hollow and very light. The walls vary in thickness, which causes the red color to become more intense in the areas where the plastic is thicker and almost water clear where the walls are thinner. 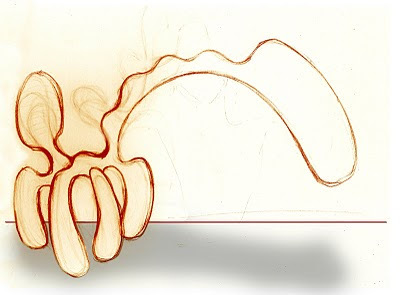 The shelling process has also allowed me to create a bottom heavy counter balance, which allows the neck and head to be extend in an giraffe like appearance with an almost transparent head. This is the edge of a native grass field that has never been plowed. It is slowly being overrun but a tidal wave of privet. Anne Albagli and I went out to La Reunion Tx today. It was again damp, muddy and slick, but after whacking away at privet for an hour, the cold damp didn't feel so bad. I brought along a cornucopia of saws, hedge clippers, and hatchets to test out. Branch trimmers work the best for anything smaller than an inch in diameter. Bigger than that you need a pull saw. Those come in lots of shapes and teeth counts. Lots of teeth seem to work the best. The privet is to wiggly for a standard push saw or an axe to efficiently cut lots of privet. I did notice areas where people had used a chainsaw. Agin the wiggliness of the branches resulted in heavily splinter stumps. 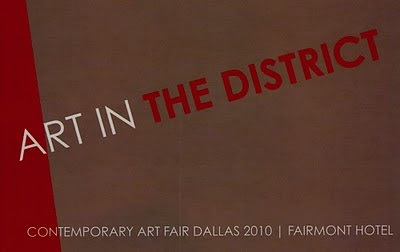 Posted a little blurb about the Art In The District 2010 art fair on Art and Seek. Just hoping to get the word out a bit more. I just posted an article about the second annual Dallas Art Fair on Art and Seek, click here. I am heading down there tomorrow to hopefully load up my eyeballs on some hot relevant artwork. Then I'll pop over to the new Art In The District 2010 art fair. Perhaps if I am lucky I will OD on art.